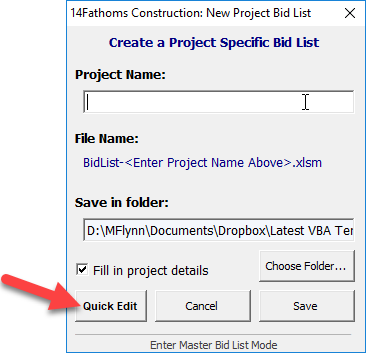 What is the “Quick Edit” button in the Bid List and how do I use it? This mode creates a temporary bid list file which can be used to make quick updates to CSI codes, company details, and/or contact information. Changes made in Quick Edit mode are synced across all the bid lists at your company. Use this mode instead of creating “temp” project or “abcdefg” project or whatever else you might use to make a quick change. Also, any updates made from project bid lists also sync to the other lists at your company, so no need to make the same update in multiple files. ← How do I make my 14Fathoms file faster and more responsive?